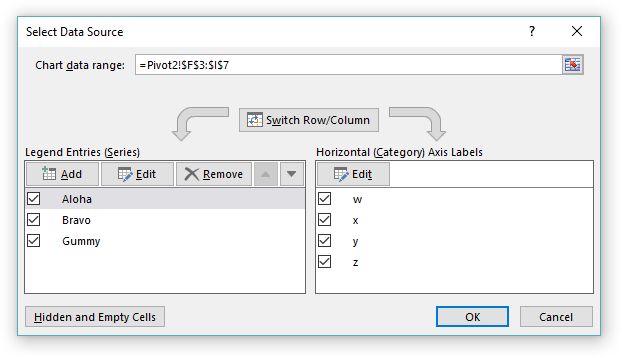 The second pivot table automatically groups the data based on the first pivot�s grouping. And if you change the grouping on the second pivot, the first pivot table changes too.. Bo hoo hoo ?? And if you change the grouping on the second pivot, the first pivot table changes too..... I'm looking for a way to add multiple fields in the Values bin of a pivot table (The one below Column Labels). The below code adds my fields to the Column Labels bin instead. Since summarizing a Pivot Field can only be applied to an entire column, I only need to look at a single cell in each Pivot Table Field. Instead of looping through every cell in the user selection range, I narrow the range I want to work with down to just the first row of the user's selection. I'm looking for a way to add multiple fields in the Values bin of a pivot table (The one below Column Labels). The below code adds my fields to the Column Labels bin instead. With the VBA macro, the Pivot Table ends up with Name and ID as column fields and Group as the row field. With the Powershell script, only the Name is made a column field. The ID is not made a column field. Group still becomes a row field. The second pivot table automatically groups the data based on the first pivot�s grouping. And if you change the grouping on the second pivot, the first pivot table changes too.. Bo hoo hoo ?? And if you change the grouping on the second pivot, the first pivot table changes too..